As the second week of football comes to an end, Tony Romo gets injured, and sportsbooks quickly shift the odds preparing for the worst. The Dallas Cowboys quarterback has a fractured left clavicle, and the injury happened after he was driven into the ground by a defender in the third quarter of the team’s 20–10 win over the Philadelphia Eagles; he suffered the same injury in 2010. 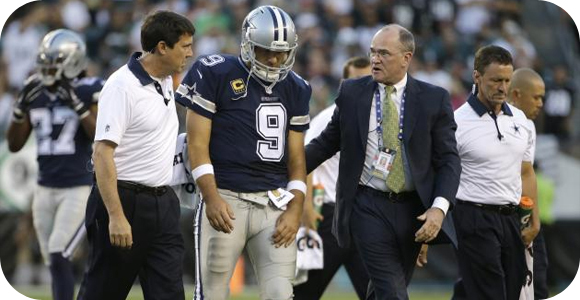 The Cowboys have confirmed that he will not be undergoing surgery, but rather will be sidelined for eight weeks. This would let him get healthy with 6 games left in the NFL regular season, so it will all depend on how well his replacement, Brandon Weeden, can perform; he is just a 5-16 starter. This is the reason that most Las Vegas books are starting to shift their odds on the Cowboys, as they will not have their star QB on the field, at least for most of the season. Dallas was being favored for their upcoming game against the Falcons, but those odds have since shifted (-3) in favor of the Falcons. The line will probably continue to move throughout the week, but in the end, it may settle with the Cowboys being the underdogs. This may be the case for the first game with Weeden starting this season, but for future games, the Cowboys might get better odds. A few examples of changing odds include Sportsline, who have changed their season projected wins from 9.5 to 8.3, and MGM Resorts have raised the Cowboys odds of winning the Super Bowl from 8/1 to 10/1. Sportsbooks are not shifting their odds a great deal, which should give Dallas fans some hope for this season.